San Dimas 62, Rowland 47 — Donnell Leffridge had 28 points and seven rebounds and Spencer Bandow and Andrew Sanchez each had 11 points for the Saints (15-8, 6-0) in a Valle Vista League victory. Bandow also had nine rebounds and Abbas Darwich had 10 rebounds. Curtis Hong had 14 points and Phillip Aguiniga scored 11 points for Rowland (14-9, 4-2). Edgewood 72, La Puente 70, 2OT — Ozzy Mancilla scored a game-winning 3-pointer and had 12 rebounds for the Lions (16-5, 3-3) in a Miramonte League game. Also for Edgewood, Daniel Felix had 21 points, Niko Yamanoto added 19 and Sebastian Andrade had 12. Wilson 62, Baldwin Park 51 — Ethan Sims had 30 points and Jeffrey Von had 12 points for the visiting Wildcats (8-12, 2-3) in a Valle Vista League win. West Covina 68, Charter Oak 58 — Nick Hard scored 31 points and had 10 rebounds, six steals and seven assists and Darian Nickols added 22 points for the Bulldogs (13-10, 3-3) in a Hacienda League victory. Los Altos 53, Diamond Ranch 52 — Bryan Hillard had 22 points and 19 rebounds for the Panthers (4-17, 1-4) in a Hacienda League loss. Rosemead 38, El Monte 37 — Krystal Espinoza had 18 points, Amy Ung had 10 points and Kathleen Phan had 10 rebounds for the Panthers (12-10, 5-3) in a Mission Valley League game. Diamond Bar 3, Ayala 2, OT — Kayla Pak scored three goals, Valerie Araya had two assists and Reena Kang had an assist for the Brahmas (4-10-4, 1-4-1) in a Palomares League match. Glendora 3, South Hills 1 — MacKinley scored twice and Hanna Goff scored for the Tartans (15-3-1, 6-0-0) in a Palomares League victory. Also for Glendora, Blake Manke, Alexis Rushlow and Jillian Juarez each had an assist. La Puente 66, Bassett 12 — Scoring pins for the Warriors in a Miramonte League match were Joel Izarraras (106 pounds), Juan Milan (113), Daniel Juandiego (126), Ricardo Escalante (154), Alex Villegas (160), Ronnie Mireles (195), Louis Torres (195) and Andrew Ramos (220). 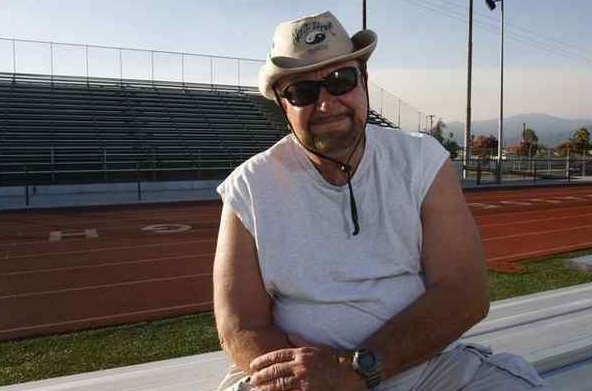 Tony Zane, who won two CIF Southern Section football titles at Baldwin Park, coached two CIF-SS players of the year and is considered one of the top offensive minds in area history, passed away Friday. Zane was hospitalized for nearly three months with a respiratory problem before succumbing. He was 76, and is survived by his wife, Shirley, and daughter, Tatiana. There will be a memorial service at 11 a.m. on Friday at Christ’s Church of the Valley, which is at 1404 W. Covina Boulevard in San Dimas. Zane, along with friend and former Baldwin Park head coach Ty Pagone, put the Braves on the area football map. They came to the area school, with Pagone as head coach and Zane as offensive coordinator, in the 1970s. Baldwin Park soon rode the ladder to success. The duo helped the Braves to the Desert-Mountain Conference title in 1980, with Zane, who succeeded Pagone when the latter retired before the 1990 season, leading the Braves to the 1991 Division IV title. Overall, Zane coached 31 years at Baldwin Park, the final 13 as head coach. He won 47 playoff games and 16 league titles. He retired in 2002, but did resurface for a few years, becoming Bassett’s offensive coordinator in 2009 for then Olympians coach Leon Ward. “He was a good friend. We went to high school together and coached together for 30 years or so,” Pagone said. “He was a good friend and brilliant football coach. He was good with people, good to kids. And Baldwin Park was the beneficiary. 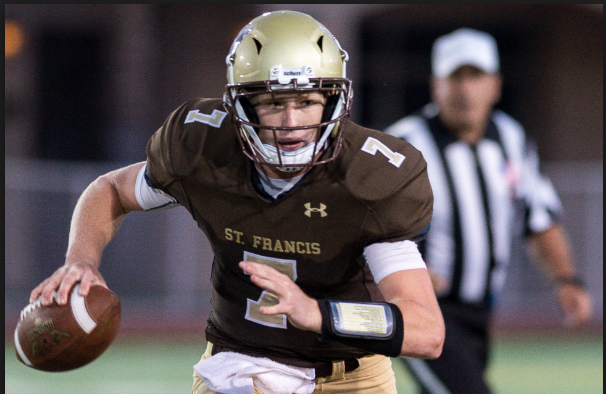 The Braves, with Zane calling the shots, became a tough team to defend, and opposing defensive coordinators stayed up nights trying to figure a way to stop Zane’s high-powered attack. “He and Ty Pagone, they were the earliest throwers in the Valley,” said Maranatha coach Steve Bogan, who won four CIF-SS crowns at South Hills and was also one of the area’s best defense backs during the 1970s, playing for Edgewood. “I can remember being defensive coordinator against him. One game, we had our cornerback out. We were (hoping) that Tony (wouldn’t) find (the backup), because he will find him and when he does find him, everything changes. We won, but they threw three touchdown passes in a quarter and half once Tony figured it out, going at him, at him and at him. The beneficiaries of Zane’s schemes were quarterbacks Mike, Norm and Greg Santiago; Michael Johnson, Marc Ruiz and Richard Robles to name a few. All were proficient passers under Zane, with Johnson (1984) and Ruiz (1991) earning CIF-SS Player of the Year in Division III and IV, respectively. Mike Ryan, who coached with Zane at Baldwin Park and later with Bogan at South Hills, said Zane was always on the cutting edge of football strategy. He was a guru in the truest sense of the word. But Zane was not all Xs and Os. There was another side that only those in his inner-circle saw. Zane was also extremely loyal to his friends, former coaches he worked with and his players. His loyalty to Lawrence Phillips, the late former star who had legal problems most of his adult life before dying in prison last year, is well-documented. But there were other former players he helped through the years. One is Duarte’s James Heggins. The Baldwin Park alum, who completed his first season at Duarte last fall, has won league titles for Baldwin Park and Duarte. Heggins was on Baldwin Park’s 1991 CIF-SS title team. Ryan didn’t play for Zane, but he said he became a better coach and person for knowing him. “He was a great guy.” Ryan said. “He was the first person who really befriended me when I came to California and Baldwin Park in 1989. His sense of humor, quick wit, engaging smile, and intense football mind impressed me and helped me be a better coach and friend. Legendary Baldwin Park football coach Tony Zane, who led the Braves to two CIF championships in 1980 and ’91, and 16 league championships, passed away Friday. Zane, who coach controversial Lawrence Phillips in the early 90s and last coached at Baldwin Park in 2002, was at Baldwin Park for 31 years. Zane, known for his offensive mind, coached Michael Johnson (1984) and Marc Ruiz (1991) to division player of the year honors. Zane returned a few years back to be an assistant at Bassett, and during that time former South Hills and Maranatha coach Steve Bogan explained what an offensive genius he was. We’ll have more on Zane tomorrow. Montebello High School football coach Pete Gonzalez has coached in his fair share of all-star games and he’s never seen anything like the camaraderie the West team has as it readies for the San Gabriel Valley All-Star Senior game Friday at West Covina High. But will it all add up to a win for the West, or will an East team that’s itching to get some pride back for it’s neck of the woods after losing two straight in the series remind everyone who has historically been the boss in the series. Kickoff is 7 p.m.
“I’m most impressed that they’ve all shown up,” Gonzalez said referring to having had full participation in practice. “I really appreciate the fact that they’ve put their time in. I know we’re up for a big challenge, but I’m really impressed with our commitment to the game. The West offense should be dangerous by land or air on Friday. La Salle running back, the Pasadena Star-News Player of the Year, is the headliner while Star-News Offensive Player of the Year Michael Bonds figures to get the lions share of the quarterback duties. When Bonds drops back to pass he will likely be looking for Arcadia Raeshawn Roland, who is one of the top receivers around. Whether Bonds will have much time or Milliner much room is the big question because the East defensive line is no joke. The Los Altos tandem of Jayson Jones (nose guard) and defensive end Andrew Manuele headline a unit that has shined in practice. On offense, the East is led by a dangerous group of running backs led by San Dimas’ Jarrell Sykes, Northview’s Kevin Thomas and La Serna’s Matthew Marshall. It’s looking quite obvious that on either side of the ball, the East is looking to bully the West with its physical nature. Although it’s an all-star game, Martinez said he and his staff have been driving home that the goal is to win on Friday. The East has lost the last two installments after establishing a seven-game win streak prior to the 2015 game. The East still comfortably leads the all-time series 23-13-2. The West, however, seems bent on adding to its budding streak. 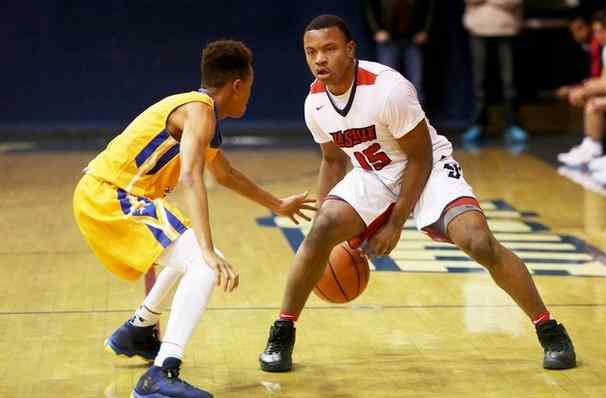 Notebook from last week: After losing the past two installments of the East-West SGV All-Star Game, the East team is bent on getting back on the winning side of a ledger it dominated for so long. 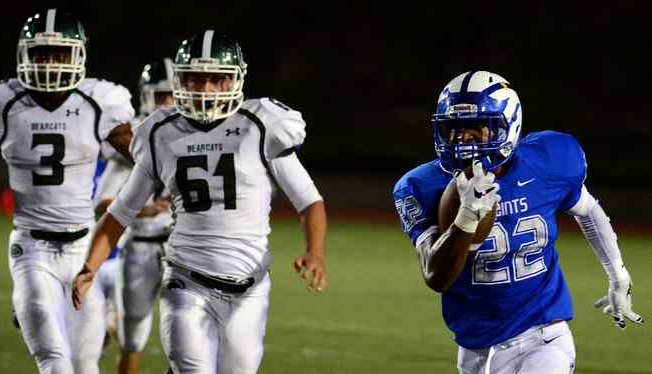 And a major weapon may help them do just that.It’s still unofficial, but East coach Eric Martinez of Diamond Ranch is hoping to secure the services of Oregon-bound Rancho Cucamonga running back Jaylon Redd, who told Martinez he’d like to play and will be on the East’s first roster. Bishop Amat falls to St. Monica – The Bishop Amat High School girls basketball team may have been undersized and undermanned against the Camino Real League’s first place team — St. Monica. But what the Lancers lacked in height and depth, they made up for in heart and determination. However, St. Monica fended off Bishop Amat’s valiant effort and late fourth quarter rally to win 54-50 on Thursday night in La Puente. Rowland 4, San Dimas 0 — Goalie Viktoria Kozak had a shutout, Melissa Rodriguez scored twice and Ruby Fernandez and Taylor Bausley each scored a goal for the Raiders (11-6-2, 4-2) in a Valle Vista League game. Garey 3, Bassett 1 — Andrea Noquez, Isabel Correa and Kimberly Uribe each scored a goal for the Vikings (6-6-3, 4-1-1) in a Miramonte League win. Glendora 1, Diamond Bar 0 — MacKinley Gregus scored a goal with an assist from Alexis Rushlow for the Tartans (14-3-1, 5-0-0) in a Palomares League win Wednesday. Diamond Ranch 1, Chino 0 — Rae Perez scored a goal for the Panthers (6-7-3, 2-2) in a Hacienda League match Wednesday. Los Altos 11, Charter Oak 5 — Brooke Contreras scored five goals and goalie Delilah Manriguez had 13 saves for the Conquerors (3-0) in a Hacienda League win. Katie Fugit scored three goals and had six steals, Emma Tuck had four steals and Emily Ramirez and Sabrina Shaw each scored a goal for the Chargers (2-1). Rowland 57, Wilson 43 — Ethan Sims had 24 points and Jeffrey Von had 11 points for the Wildcats in a Valle Vista League loss Wednesday. Rowland 79, Wilson 40 — Parvene Barimani had 13 points and Calley Wu had 14 rebounds and nine points for the Wildcats in a Valle Vista League loss Wednesday. Bishop Amat loses big game at La Salle: With the top of the Del Rey League standings as tight as can be, both the Bishop Amat and La Salle high school boys basketball teams knew there was no margin for error on Wednesday night. Both teams played like it. San Dimas 57, Covina 46 — Donnell Leffridge had 18 points, Abbas Darwiche had 11 points and 14 rebounds and Spencer Bandow and Andrew Sanchez each had nine points for the Saints (14-8, 5-0) in a Valle Vista League win. Angel Rivas had 18 points and Bryan Gutierrez had 10 points for the Colts (14-8, 3-2). Rowland 57, Wilson 43 — Curtis Hong had 18 points, five rebounds and five assists and Dameon Thomas and Jarbas Faria each had 13 points for the Raiders (14-7, 4-1) in a Valle Vista League victory. Diamond Ranch 53, Chino 52 — Coree Joseph had 16 points and Bryan Hillard had 11 points and 13 rebounds for the Panthers (4-16, 1-4), who won their first Hacienda League game of the season. Los Altos fends off West Covina: Los Altos got a big defensive play at the end of the game and held on for a 53-50 win over West Covina on Wednesday night.Senior Kaylee Shozuya blocked what could have been a game-tying 3-point shot with 12 seconds left and the Conquerors escaped with their 14th consecutive win. 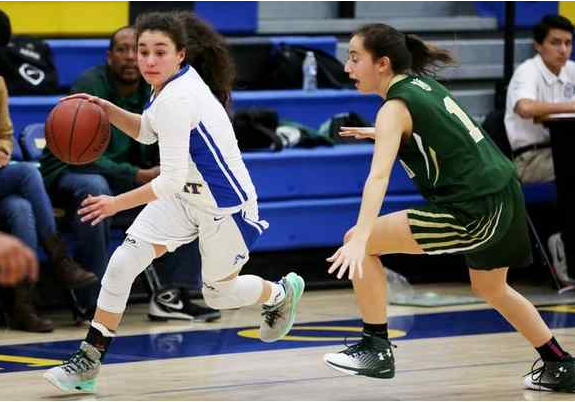 The Conquerors (18-2, 5-0), Southern California News Group’s second-ranked girls basketball team finished the first half of Hacienda League play undefeated and remain a game ahead of Walnut. Duarte 65, Gladstone 43 — Ryley Thompson had 18 points and Patricia Morris had 16 points, 12 rebounds and five blocks for the Falcons (19-4, 5-0) in a Montview League win. Rowland 79, Wilson 40 — Tianna Eaton had 31 points and seven rebounds, Kaylin Ngo had 13 points and Faith Castillo had 12 points for the Raiders (19-1, 5-0) in a Valle Vista League victory. Los Altos 5, West Covina 1 — Juan Lopez scored a goal for the Bulldogs in a Hacienda League loss. South Hills 1, Claremont 0 — Madison Warren scored a goal with an assist from Isabella Valderrama for the Huskies (9-7-1, 4-1) in a Palomares League win. Goalie Viviana Poll had a shutout. San Gabriel Mission 5, Ramona Convent 0 — Juliana Lopez scored three goals and Melissa Estrada and Isabella Lopez each scored a goal for the Pioneers (10-3, 4-0) in a Horizon League match. Gladstone 1, Duarte 0 — Kim Bernal scored a goal with an assist from Daniela Mendez for the Gladiators (6-5-1, 2-2) in a Montview League victory. West Covina 2, Los Altos 2 — Serina Vargas scored twice and Lauren Sanchez and Gianeece Serrato each had an assist for the Bulldogs (8-2-8, 3-0-2) in a Hacienda League tie. 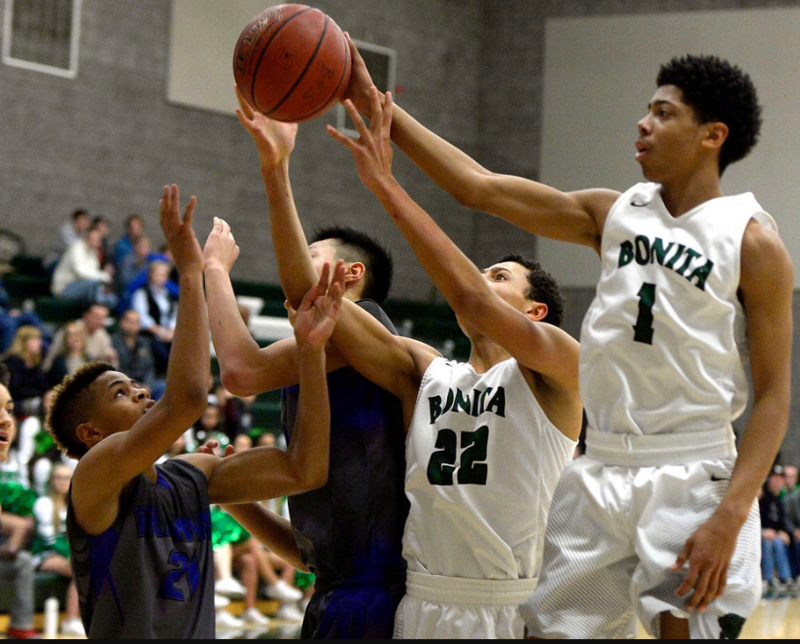 Bonita holds off Diamond Bar: Bonita High School boys basketball star Joe Quintana has provided the spark that has lifted his team atop the Palomares League standings. But that spark started to flicker as the senior guard twisted his left ankle early in the first quarter in a key league showdown against Diamond Bar on Tuesday night. However, Quintana wouldn’t be denied a chance to help his teammates. He rejoined them on the court and scored 25 points to lead the Bearcats to a 72-56 win over Diamond Bar at Bonita High. Chino Hills wins 56th straight: The Chino Hills boys basketball team relies on its frentic pace to wear opponents down. Few can play at the pace the Huskies prefer, especially for four quarters. Rancho Cucamonga fared well late in the first half but in the end it was Chino Hills still prevailing 122-74 in Baseline League play on Tuesday nightIt marked the 56th straight win for the Huskies (21-0, 5-0) who are chasing a state record of 66 straight wins by Compton (1987-1989). Damien 73, Etiwanda 63 — Justin Hemsley had 22 points and 11 rebounds, Cam Shelton had 22 points, seven assists and nine rebounds and Elijah McCullough had 16 points for the visiting Spartans (21-2, 4-1) in a Baseline League victory. South Hills 59, Ayala 50 — Jason Rodriguez had 33 points and Dalton Clevenger added 10 points and had five rebounds for the Huskies (10-12) in a Palomares League victory. Glendora 68, Claremont 36 — McKayla Tilton had 19 points and Alex Lowden had 14 points for the Tartans (19-3, 4-1) in a Palomares League win. Damien 3, Etiwanda 1 — Yusef Abd-Allah scored twice and Christian O’Connor scored a goal for the Spartans (7-6-1, 3-2) in a Baseline League win. Garey 2, La Puente 0 — Goalie April Keo recorded a shutout and Veronica Alvarez and Andrea Noguez each scored a goal for the Vikings (5-6-3, 3-1-1) in a Miramonte League game.